The aid scheme, the New Alliance for Food Security and Nutrition, is at the forefront of this agenda. A noble sounding name masking a dangerous corporate take-over. Through the scheme, aid money and corporate investment are promised to the 10 countries signed up but in return these countries have to make changes to their seed and land laws which greatly benefit multi-national companies but are disastrous to small farmers. The scheme has attracted widespread criticism and rejection. Last year over 100 farmers and civil society organisations from Africa and around the world called on all governments to pull out and withdraw funding from the New Alliance. The European parliament is currently reviewing the New Alliance and commissioned an expert report, which also delivered a scathing critique of the scheme. 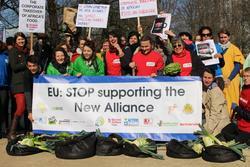 A large coalition of civil society organisations, NGOs and food campaigners have been working together closely across Europe to call on the European parliament to withdraw the EU’s support from the New Alliance. On Monday, this coalition turned up in Brussels during a European parliament meeting on the New Alliance to demonstrate the strength of public opposition to the New Alliance and ensure that MEPs listen to the waves of criticism levelled at the New Alliance. Time is short. Next month key MEPs are voting on what the EU’s response should be to the New Alliance. Now is the opportunity to call on MEPs to and ask them to withdraw the EU’s support from the New Alliance. Take action.